Oak wilt is a serious disease that can infect many oak species. It is caused by the fungus, Ceratocystis fagaceous. 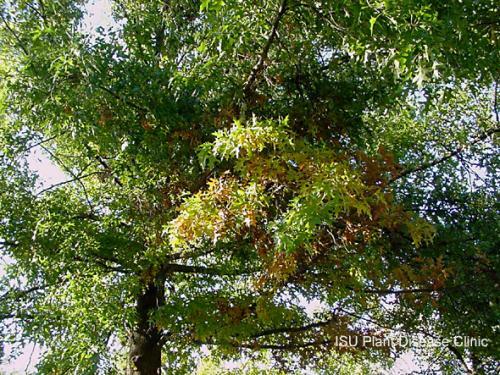 Red oaks are very susceptible to the oak wilt fungus and can die within 4-6 weeks. White and bur oaks are moderately resistant to the disease. Trees can be infected by the fungus through root grafts or by beetle vectors that carry spores to newly wounded trees. When a tree is infected it tree tries to protect itself by producing gummy material called tyloses which can clog the water conducting vessels. Water is prevented from moving to the canopy and leaves begin to wilt. Leaves of infected oaks can wilt, turn brown at the edges, and fall off. The outermost ring of sapwood sometimes turns brown and appears as streaks when the bark is peeled; or as a ring when the branch is cut in cross-section. Because oak wilt is often confused with other disorders, positive identification requires recovery of the causal fungus from the tree. (sapwood) on the branches (C). The Iowa State University Plant and Insect Diagnostic Clinic can help you to investigate and confirm if you plant has this disease. Please see our website for current forms, fees, and instructions on collecting and packing samples. Contact information for each states diagnostic laboratory for U.S. residents can be located at the NPDN website. If you have a sample from outside of Iowa, please DO NOT submit it to the Plant and Insect Diagnostic Clinic without contacting us. Sampling time: July to early October. Stop collecting samples after annual leaf fall begins in the fall. Avoid pruning or taking oak samples between the months of April and June. This is the high-risk period for oak wilt transmission, where both peak spore and mat formation and peak insect vector flight coincide. Collect the sample only when you can either deliver it directly to the Clinic or to send it overnight (never send on a Friday!). Prepare a styrofoam or plastic chest and ice packs (see example in next page). Refrigerate the sample (from collection to delivery). 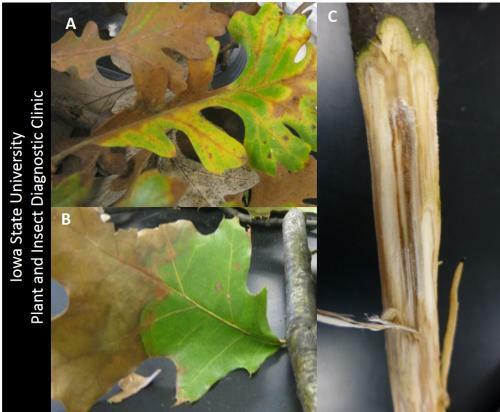 The pathogen that causes oak wilt cannot survive in hot weather. If the samples are left in the truck or by the house porch for as few as a couple of hours the chances of recovering the pathogen significantly decrease. Observe symptoms, look for the symptoms (wilting, yellowing and/or bronzing). Select branches where symptoms are developing. Collect 3 to 6 living branches from the symptomatic area in a tree. Branches should be at least 1 in diameter and 6 to 8 inches in length (we need branches, not twigs). With a knife peel the bark and inspect for vascular discoloration. When discoloration found, collect additional branches from that symptomatic limb. Select some leaves, sending symptomatic leaves (bronzing) is a bonus, it gives important diagnostic information. Place your completed submission form in a bag to prevent it from getting wet. Ship the package early in the week via overnight delivery. Do not send on a Friday. Walk-ins are welcome! 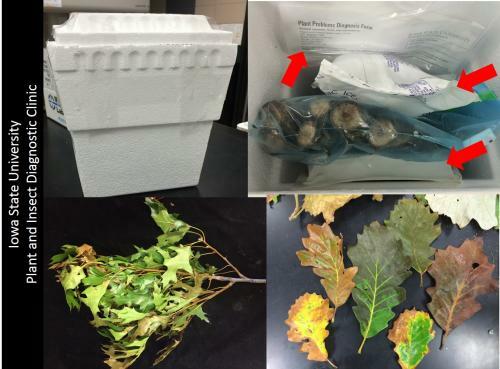 please remember to include leaves samples. Avoid wounding or pruning oaks from April through July since sap attracts the beetles that carry the oak wilt fungus. Check risk of oak wilt page. Severing root grafts connecting infected and healthy trees up to 50 feet apart can be used to prevent spread. Fungicide injections are now available to protect healthy trees from the disease. Infected trees can also be treated, but a tree with more than 20% crown loss has little chance for survival. For more information about oak wilt visit this bulletin. Parts of the berries on my red raspberries are white in color. Why?